Kanum Thai is a family owned and operated Irish establishment. Kanum was established by brothers Marc and Niall Fitzharris along with their Uncle Michael Loftus in 2009. Marc and Niall’s mother Breda is now a director of the company and manages the Rathgar branch on a daily basis. Currently Kanum has two branches: one on Mespil Road, Ballsbridge and another on Orwell Road, Rathgar. Kanum also has three outside catering units which serve at seven lunch-time markets per week around Dublin as well as all the big festivals through-out the year. The whole operation is overseen by Kanum’s General Manager Daniel Duggan. Kanum provides an Eat-in, Takeaway or Home/Office Delivery service from noon until late seven days a week. Kanum uses meats traceable directly to the farm and fresh vegetables in its food preparation. Kanum never uses MSGs and promises to provide its customers with restaurant quality food at takeaway prices. 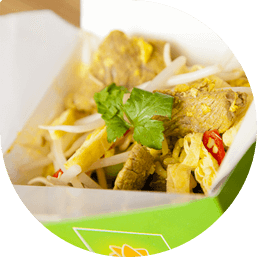 Due to all our food being low in fat, Kanum really can provide customers with a guilt free takeaway!